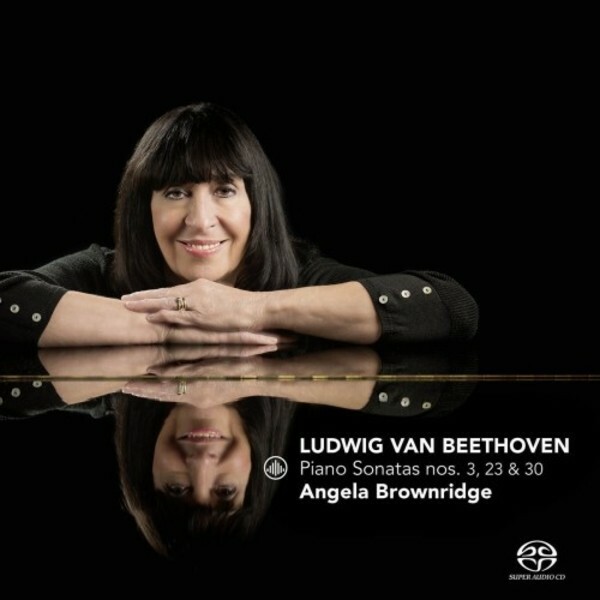 An excursion through Beethoven’s output with three Piano Sonatas from his early, mid and late periods, this is the first release on Challenge Classics by the highly-esteemed pianist Angela Brownridge. In an age which has become over-fascinated with mere technique, and which seeks the degree of ‘perfection’ offered by over-edited CDs, Brownridge’s playing restores spontaneity, character, and beauty of sound to the platform. Here she performs the Sonata in C major, Op.2 No.3, written by Beethoven shortly after he relocated to Vienna in 1795, the passionate Sonata in F minor, Op.57 (1805), and the Sonata in E major, Op.109, the first of the final three great sonatas, composed in 1820. Hailed as a major star in classical music, Angela Brownridge has been compared with such pianists as the legendary Solomon, Rachmaninov, Cherkassky, and Bolet. She has appeared in all the major London concert halls, and has visited Eastern and Western Europe, the USA, Canada, the Far East and Australia, as well as performing extensively throughout the UK. Brownridge has been soloist with many leading orchestras and conductors, and festival engagements include Bath, Edinburgh, Warwick, Newport Rhode Island, Bratislava, Brno, Hong Kong, and Maastricht. Her recorded repertoire is very varied, including some first ever collections of the complete piano music of Barber, Gershwin, Kenneth Leighton and the complete piano concertos of Saint-Saëns.